In 2011, Irisys won in the International Trade category because of its outstanding export achievements. Irisys-developed predictive Queue Management is used by many of the world’s leading retailers, including Tesco, Morrisons and Kroger, to slash waiting times at checkouts and make better use of staff resources. Invest in R&D: Continued investment, even during an economic downturn, means British products stay at the global cutting edge. Finding resources for R&D when budgets are tight can mean boardroom battles – but it is critical to think long term to reap the big rewards. Listen to your customers: When Tesco told us they wanted an automatic means of cutting queue waiting times, we invented a solution from scratch. It’s working brilliantly for them – and for Irisys, because we now apply similar solutions to similar operations worldwide. If you solve one customer’s problem, you can roll it out to many others. That’s a very strong business model which substantially reduces risk. Create the right culture: Recruiting and retaining the best people is one of the biggest business challenges. Give your team the opportunity to work at the cutting edge of technology – or whatever sector you’re in – in a fun, stimulating environment and they’ll want to stay for the exhilarating ride. About Irisys Infrared Integrated Systems Ltd (Irisys) designs and manufactures thermal detectors and systems which are used for people counting, queue management, thermal imaging, security and healthcare applications. Irisys started trading in 1996 and now exports over 80% of its production to more than 50 countries worldwide. The company invests a double digit percentage of revenues in R&D, and holds over 70 patents. One in six employees has a Ph. D.
The Queen's Awards for Enterprise is a programme for British businesses and other organizations which excel at international trade, innovation or sustainable development. 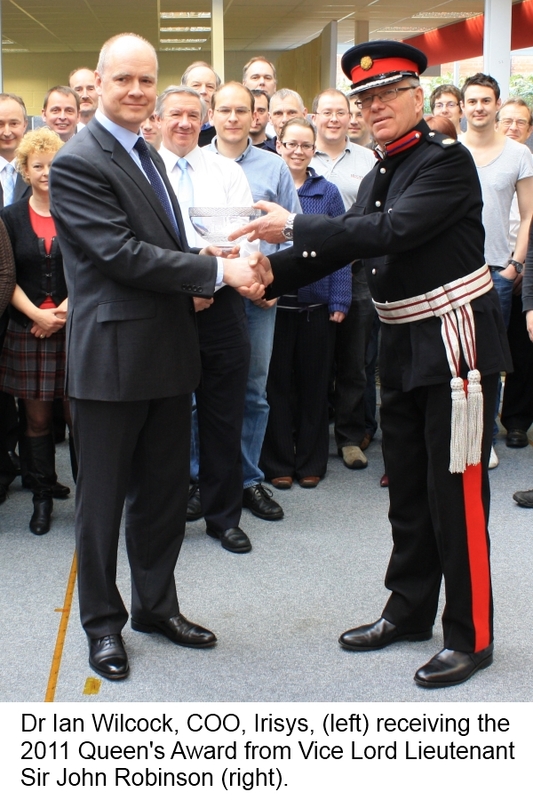 To be awarded the Queen's Award for Innovation, Irisys had to demonstrate continuous innovation and development over at least five years. Awards are made on the advice of the Prime Minister after examination of applications by an Advisory Committee composed of leading individuals from industry, commerce, trade unions and government. The awards are conferred annually by the Queen on her birthday: 21 April. Winners are allowed to use the Queen's Award emblem in advertising, marketing and on packaging for a period of five years. Winners attend a garden party in July at Buckingham Palace, and are visited during the year by a Lord Lieutenant, the Queen’s local representative, to present the award, a crystal chalice.